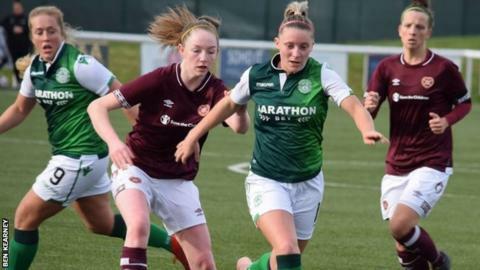 Holders Hibernian won the Edinburgh Derby against Hearts Women in the first round of the SWPL Cup. Kirsten Reilly's first half goal was enough for the Hibees to squeeze through 1-0 as they attempt to win the trophy for a fourth year running. Elsewhere, there were big wins for Glasgow City, Rangers, Celtic, Motherwell and Spartans. Forfar Farmington and Stirling University also edged through with 2-1 wins.